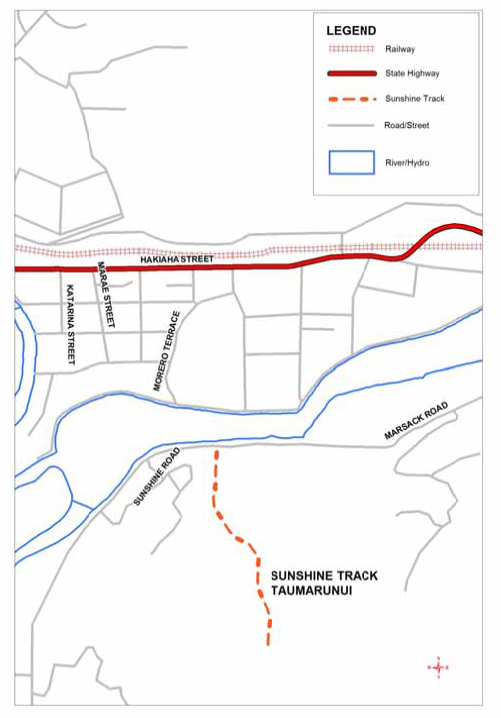 Drive 12 km down SH 43, from Taumarunui and cross the Te Maire Bridge on Paparoa Road. A short distance on turn left into Te Maire Valley Road and continue to the car park. The reserve is sign posted and here is the beginning of a very enjoyable walk. This is the most northern part of the Whanganui National Park. The moss covered bush is fairly dense to begin with and is cool and pleasant. Board walks cross some boggy places and a swing bridge crosses the attractive Te Maire Stream that tumbles over a clay bottom. A short distance on the track divides to form a loop. The track is an uphill climb, with the left branch being shorter and steeper but with good steps to help as it meanders back and forth. There are picnic tables set among the bush where you can sit and contemplate and listen to the bird life. It is a lovely walk to the top where there is another picnic table to take time for a rest. The track continues along a ridge and eventually drops downhill again to the junction to form the loop. From here it is just a short walk back over the swing bridge to the car park. This is a good track and an ideal family walk, as it is not too steep. After rain parts can become a little muddy and slippery but it is a very pleasant way to spend a couple of hours.